What surprised me the most about New Suicide Squad Vol. 1: Pure Insanity is that it's not really so "new." 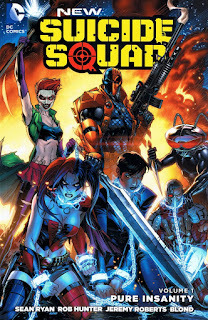 Much like DC's recent Deathstroke relaunch, I thought the point of relaunching Suicide Squad with new numbering was to take a breath, get some space, and then do something entirely different (read as, more attuned to discerning readership, more marketable, more attractive to curious movie-audiences, etc.). Sean Ryan's Pure Insanity, however, is tonally similar to the New 52 Suicide Squad that preceded it, with absurd comic book violence and madcap humor. Ryan does well by some of the characters and I wouldn't dismiss the whole thing yet, but I'm afraid New Suicide Squad isn't off to the start I was hoping for. Bar none, the best thing about Sean Ryan's New Suicide Squad is his presentation of Black Manta; to be sure, if DC Comics wanted to just cancel New Suicide Squad and give Ryan a Black Manta series instead, you wouldn't hear me complaining. When the new Suicide Squad's first mission immediately goes sideways -- as they always, always seem to do -- Manta steps up as team leader and leads the Squad with honor and integrity through all eight issues of the collection. Maybe "honor and integrity" isn't what one wants from a Suicide Squad book, but Manta is the only character here who's serious about his job, the only one who's mission-focused. There is some dumb pleasure to be found in Harley Quinn and the Joker's Daughter beating the snot out of one another, but I think what today's indie-focused audiences want from Suicide Squad is some combination of a mob movie and Ocean's 11 with supervillains, and Manta is the only character who delivers that amidst what really is, otherwise, pure insanity. And the book's first four-issue arc is pretty insane, between Harley and Joker's Daughter antagonizing one another (with credit to the pretty funny "Stop copying me!" gag), Deathstroke defecting almost right away, and the sheer chaos that is the running argument, mid-mission, between team leaders Amanda Waller and Vic Sage. The book is neither consistently (nor perhaps intentionally) funny enough to be considered a comedy, but there's a weird delight in Sage, Waller, and Manta, again in the middle of a misson, arguing whether a change in mission parameters means it's the same mission or a different mission, until Sage completely loses his cool and starts shouting, "It's not a whole new mission! It's the same mission!" -- though it's never quite clear what tone Ryan is trying to achieve with the insanity. At some point, the turncoat Deathstroke says to Deadshot, "It's all pointless. So embrace the insanity," which doesn't, I hope, reflect the book's mission statement; I'm looking for a Suicide Squad with a point, not that's pointless. Muddling what Ryan's trying to say, for instance, is his use of Vic Sage altogether. We all know that historically journalist Vic Sage has been the Question, urban DC hero and sometimes conspiracy-theorist. There is a Question-like figure in the New 52, part of the Trinity of Sin, though never specifically named as (and seeming not to be) Sage. Ryan's Sage is a fairly repulsive figure who wants to create a 1990s-type "extreme" Suicide Squad "XL," but who can't hold a mission together, says some insulting things to Waller and gets knocked around as a result of it, and who gets no respect when he goes whining to his higher ups. Had Ryan named this character anything else, I wouldn't think twice about this foil for Waller who's plotting against her behind the scenes. But Ryan calls him "Vic Sage," and so I'm looking for hints of the guy being good or being Question-esque. Eight issues in, I haven't found any of those hints yet, and so I'm left to wonder if Ryan has a plan or if indeed it's just more "pure insanity." Art is another problem here. Pure Insanity has eight credited artist/inkers in eight issues, which is already a signal something's not right. I appreciate that DC editorial tried to keep it all consistent by having a single breakdown artist for the book, but that artist is Tom Derenick, who's work often doesn't appeal to me. At times the art in the book is passable; at times it's strangely distorted, as in the fifth issue by Rob Hunter in which Deadshot has an oddly thin, elongated head in one panel. To me, it's an indication of DC still not doing anything "new" with New Suicide Squad; putting someone like Cameron Stewart on this title, for instance, would be a better sign of a Suicide Squad geared toward mature audiences than the puerile tone it's had since Flashpoint. The book's violence comes off equally juvenile; either there's no consequence, as when Harley beats Joker's Daughter to unconsciousness but then Joker's Daughter doesn't have a scratch on her, or the image of the Reverse Flash's knee exploding, which is so cartoonish as to be hard to take seriously. I have heard, post-Convergence, that this book picks up a bit, which might be the only reason I give the second volume a shot; after remaining loyal to Suicide Squad throughout the New 52, I don't think I can continue supporting a book I just don't enjoy. Sean Ryan's New Suicide Squad Vol. 1: Pure Insanity has Black Manta and other interesting bits -- how Harley Quinn's craziness seems to come and go, Amanda Waller's curiously normal assistant Bonnie -- but it doesn't in total add up to the improvement I think Suicide Squad needs, especially with its big spotlight coming up. Granted, as much as I love parodies of editorial interference and over-the-top '90's comics, I can imagine that it might eventually get tiresome, so we'll see if I feel differently when I finish the trade. Regardless, I'd be interested to hear your thoughts on this, CE. Been thinking about your comment for a couple days now, Scott. I guess I think it's a case of "if you want to talk the talk, you have to walk the walk." Considering didactic parody comics, Kyle Higgins's inaugural New 52 Deathstroke Vol. 1: The Legacy is one that sticks out to me. I believe Higgins was making a commentary about the New 52 (all these "kewl" young turks trying to show up "old" Slade Wilson), but Higgins also deepened and nuanced his message each issue, and told a good story at the same time. I get Ryan laying out the problems with Suicide Squad so far, but he was not at the same time, in my opinion, improving on them or saying anything beyond the surface level of "this was bad before." Nor was I much moved by the book's second storyline, where Ryan seemed to focus more on a new character than the Squad itself. I would grant maybe I "missed the joke" in the first couple issues, but for me I might have preferred actual improvement, not commentary. I feel it like a parodic book too. And that's why I like it. It never be an "Ostrander run", even if sometimes (more in the recent issues), authors try to put some elements and situations from there. I don't want to take this book too seriously, because I think it is not. That's sad in a way and I understand your point.